This series highlights some of the players often overlooked. The underrated, the up and comers, the hidden gems, the glue girls. The Upwind Underrated series is here to push new stories about different, and underappreciated stars in their division. These women have pushed and helped their teams to national contention, and we look forward to seeing them there! Written by the 2017 Upwind Nationals Crew, including Kaitlin Brunik, Victoria McCann, Laurel Oldershaw, and Christopher Strub. Carolyn Normile is the type of player who can do it all. She’s able to play stellar defense, throw in the wind and put up dime-ball hucks, all with seemingly effortless consistency. For AMP Normile is dependable, she makes game changing plays when she is needed. 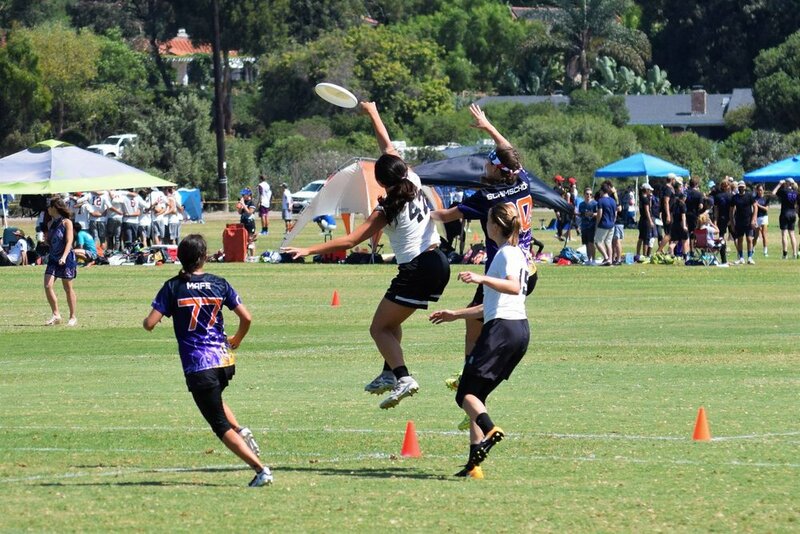 Normile has gained some recognition on the college stage on the 2015 All Star Ultimate Tour and as a Team USA member but not nearly as much as her game warrants. Any team Normile plays with is able to lean on her both offensively and defensively. Normile has a huge inside break throw that can open the entire field when she uses it. In pinch situations when the stall count gets high she makes sure she’s wide open for an easy reset. On defense, she runs hard, making plays on the disc that clearly favored the offense. It’s clear that Normile puts forth effort and preparation to be her best self with each team she plays for and AMP is no exception. She exudes a calm and collected air as she’s out there matching up against other huge names in the game. Her all-around game is one of the most consistent I’ve seen on the mixed field. Anna Thompson is the youngest player on AMP but she doesn’t let her age stop her from playing great. Working most often in the handler set she acts with the composure of a veteran even when deep in AMP’s endzone. Thompson uses quick footwork to break free for easy resets and when a throw from a teammate is off target there is no hesitation in making the diving grab. In a team stacked with stars it’s easy to lose track of the newcomer, but that’s when she’s most dangerous. When the other team takes their eyes off her for too long, might as well look to the end zone because that’s where she’s creating an easy score for AMP. The question won't be in Thompson scores, but truly how many times. One of Mischief’s many deep space operators. Schumacher is a constant threat chewing up free 20-30 yard unders or ending points on deep shots with or without her matchup anywhere to be seen. Schumacher has more acclaim (Ultiworld’s All-Club Mixed 2nd team 2016) than many of the people we’ve wrote about in this series, but her play demands more attention. It’s almost comical watching her abuse downfield defenders, it just looks easy for her. She spends most of her time on the offensive side of the disc, but shifts to D-line for make or break points quite regularly. What’s the best part about watching her cut is the gravity at which she pulls help defenders from across the field on any of her cuts. It’s like watching a mobile singularity shift around the field. Not that these help defenders offer much to stop Schumacher, but it does leave cutters open all over the field for Mischief to choose from. Based on this, even when she seems to be having a quiet game it really means that the amount of work being put into cover her has created opportunities for her teammates to blow up the box scores. Regardless if Schumacher even touches the disc in a given point she makes Mischief's road to a goal easier, and offense cleaner. We can’t wait to watch her terrorize teams in Sarasota, and carve out an even greater name for herself amongst the divisions. Chen does the little things well: marking, footwork, effort. #28 finds herself guarding handlers, and sagging into throwing lanes for Mischief’s D-line. A seldom rewarded position objectively, but one absolutely necessary for an effective D-line. The work Chen does guarding handlers creates easy defensive takeaway opportunities for her teammates, or coverage sacks on the regular. The little things that Chen does make her an incredible player. Take her extremely active mark, for instance. This sets her defense apart from many other “good” handler defenders. She not only denies the disc, but when faced up with a thrower, she challenges every pivot and pump with quick and calculated drop steps and arm flashes. She single-handedly ruins ten seconds of offensive flow every time her match-up touches the disc. Secondly, when defending the backfield she flashes passing lanes well enough to alter discs while simultaneously being able to recover back to her mark to deny free swings. In 1v1 situations she’s seldom beat for gainers or power positions, either forcing her match-ups into losing yards or awful/tight upline shots. This is due to her efficient footwork. She rarely if ever bites on fakes, and keeps her hips square and never off balance. She implements expert drop steps and almost never finds herself on her heels, or having her legs tangled up. Because of this her defense is an experiment in funnelling handlers into awkward spaces that offer their touches little to no value beyond a fresh stall count. She stunts offensive flow regularly in her time on the field. Chen would be a wonderful piece to have on any D-line as you can count on her to limit the effectiveness of an opposing backfield and create easy D’s all over the field. For Mischief in pool A they will need this as they’ve drawn the tournament 1-seed in Sarasota. In the face of the menace that is Seattle Mixtape's backfield, I’m sure that Chen will shine. I can’t think of nicer things to say watching Koo consistently define the success of BFG’s O-line throughout a game. Koo often slots as the reset handler, and offers not only free resets, but gathers power position opportunities at will as she strikes upline cut after cut. Whenever the BFG’s offense seems to slow down and stagger, Koo is there to calmly restart the whole machine with simple and elegant backfield movement. From the games I’ve caught this year, Koo hasn’t statistically been rewarded with assists or goals in large amounts, but her hockey assist numbers are through the roof. She breaks defensive looks wide open leading to easy dinks or wide open huck looks for goals. On a turn she has no problem with her matchups doing her part to prevent breaks and keep games in BFG’s favor. She also brings a wealth of experience with her, playing on Vancouver Traffic in the past and Team Canada’s Mixed team last year at the World Ultimate Guts Championship. What Koo brings to the team isn’t the flashiest throws, or gigantic plays every point. She brings steady confidence the likes of which her teammates can lean upon. BFG often scores in just a handful of throws, but when things slow down Koo shines. Without Koo BFG would be in trouble on those long grinding points that always seem more common come late in tournaments. She appears from an outside perspective most of BFG’s grittiness, and largely the nails keeping the ship together. Though her team knows her value, it’s certainly time everyone did. Linnea Soo is a shadow to her marks when BFG trots her out on D-lines to stalk opposing O-lines best cutters. Never more than a few feet from her mark, tireless, and active, she follows, and follows. Everyone on the field can see it, and feel it. It’s only a matter of time before an errant pass or fatigue sets in on Soo’s cutter. Just like that, a layout block or a run through D. She’s quick enough to keep up with any amount of faking, hesitating, and stuttering, and has the straight line speed to cover anyone on long sweeping cuts across field. Though what’s the most fun about watching her play is the size discrepancies between Soo and her marks, as she often pulls match-ups heads and shoulders taller than her. It doesn’t seem to matter either. She makes them non-factors by virtue of proximity. Beyond her person defense, she has a nose for finding the disc on quick flashes and poaches if she finds her cutter sleeping. Honestly, her size is a huge asset in this regard as it makes her hard to spot going for quick strikes on D, but recovering back to her mark without a missed step. She also has the speed endurance to cut quickly and constantly once BFG gets the turn, making her more than just a defensive specialist, and a target for break scores. Soo comes into Nationals with most recent high-pressured situation in 2016 when the Whitman Sweets finished second at USAU College Nationals. Look for her to match up against some of the biggest names in Sarasota, offering blanketing coverage and blocks along the way. One thing that we can be sure of for the young player, Linnea’s tenure in club will surely be a brilliant one. Often the players most integral to a team’s success receives little recognition due to their lack of flashy plays. Martha Lien is a rock for Drag’n Thrust and while she is not known for her showy bids or huge hucks, she has been a key contributor to Drag’n Thrust’s continued dominance in the mixed division. Joining the team in 2010 she has been a mainstay for the Drag’n offense for several years now. Lien is the quintessential O line handler, always available for the reset and liable to make smart plays when she does have the disc. Her ability to break any mark is uncanny, stripping away fierce handler defense likes it’s not even there. Lien has incredible field sense, making her an effective field marshal who moves the disc quickly across the field before the defense can adjust. Lien has been known to go entire tournaments without a single turnover, despite posting consistently high points-per-game stats at most tournaments. As the level of play continues to rise, elite games will be decided by smaller and smaller margins. At critical junctions in tight games, the difference between winning and losing is often something as small as completing that eleventh consecutive swing pass or throwing a two-yarder dump pass for the reset. Unforced O line errors break a team faster than the best defense in the world, a fact that Lien seems to have internalized and one that manifests in her consistency and steady playing style. Kat Ritzmann may be a rookie on Drag’n Thrust this year but she is having anything but a rookie year. Coming to Minnesota after graduating from the University of Delaware, she wasted no time making a name for herself. Ritzmann has been a big part of the Drag’n D line this year, taking on premier matchups and effectively shutting them down. Ritzmann generates big blocks, even late in the game, with her seemingly untiring pressure. On the flipside she plays offense with composure and has a serious arsenal of throws. She is left handed and uses it to her advantage as she steps around marks and bombs backhands to open space. Drag’n Thrust has greatly benefited from the spit-fire energy Ritzmann brings to the squad. Being such a young addition to the team it’s clear she will continue to grow as a player and teammate. In the meantime, look for her at nationals to make big plays on defense and follow it up with clean offense for breaks. Makella Daley is a spark plug for Pop, seamlessly filling any role. Daley has played on Pop the past two years and represents some of Minnesota’s finest homegrown talent. 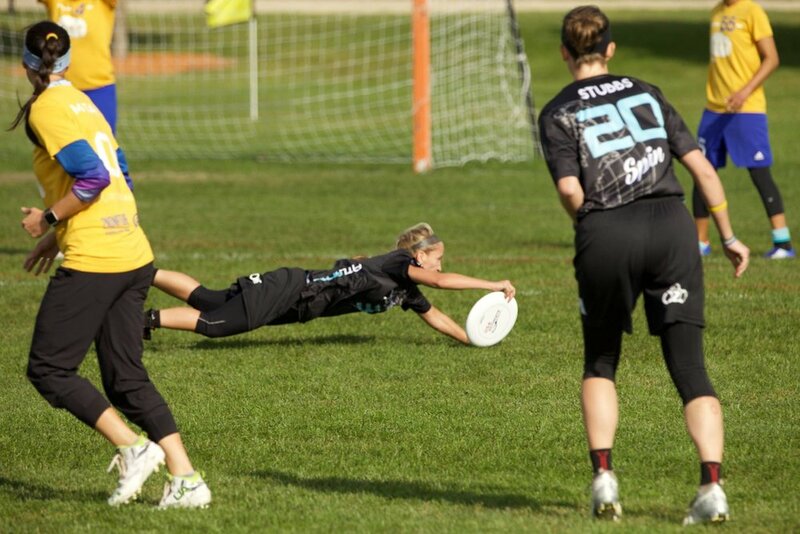 She began playing ultimate in high school in Minnesota and continued her career with the University of Minnesota Ninjas. When cutting Daley is typically the first look for Pop, creating serious distance between her and her defenders in the initiating cut, and doing so with authority. Recently she has transitioned into a handler role for Pop’s O-line. Daley plays with a steady, accountable discipline that is rare on the field. Her clear cuts are an equal intensity to her cuts vying for the disc, and even when she is standing still it is with intent, making sure to push downfield as the off-handler in order to gain as many yards as possible on the swing. Despite being a younger player on the team her consistency made her a clear choice for the Pop O-line. Daley has played a pivotal role in bringing Pop back to the national’s stage, where they are making their first debut since 2010. At regionals, she threw the final assist to Biz Cook in the game to-go, which handed the team a decisive victory over Fusion from Winnipeg. Her sharp footwork sets her and Pop up in power positions that often lead to scores. Daley’s versatility makes her a distinct threat for teams bringing a more traditional role-based game to Nationals. Anna “AJ” Uthe is the definition of a workhorse, built to grind and wear down any match up she is guarding. Uthe is a newcomer to Pop this year, moving to Minnesota after playing with the University of Utah. Her ability to put in the work has made her quite the asset for Pop, they generally match her up against the opposing team’s go-to player. On defense, she is extremely difficult to escape due to her speed and physicality. You likely won’t hear of her getting huge blocks because the opposing team won’t even throw it into her shut down defense. When the other team turns the disc, Uthe doesn’t miss a beat jetting to the endzone for what look like effortless scores. The same speed that gives her the capability to shut down her match ups also allows her to create huge distance between her and her defender. You can often find her in the endzone hanging out all alone. Uthe has already carved herself a nice niche on Pop even as a rookie. It’s clear from watching her play that her talents are still raw and she is nowhere near her limit for growth. Keep an eye out for Uthe in the next few years as she will likely make whatever club team she’s on a devious foe. Michelle Ning has been having an incredible season this year, stabilizing a vicious Vancouver Traffic O line that includes Catherine Hui and Laura Mason of the 2017 Canadian World Games Team. Ning has plenty of Team Canada (TC) experience on her own, including acting as captain of the 2017 Beach team that finished 4th at this past year’s World Championships of Beach Ultimate and last year’s TC team that matched up at the World Ultimate Guts Championship. Ning is one of the original Traffic players from 10 years ago, and is truly looking better than ever. Traffic’s offense runs through Ning, who can put the disc at all places on the field with her ridiculously low release breaks. What makes Ning most dangerous is that she has great disc control and field vision, allowing her to quickly move from a flick break to a backhand break forcing her defenders to bite on one side leaving her an easy open throw downfield. Ning is a textbook chilly center handler, constantly looking for the downfield space while calmly resetting at stall 5. She also strikes well, often looking for the give-and-go-to-huck to hit cutters Hui or Allie Short near the end zone. If Ning can stay chilly and consistent throughout the weekend, look for Traffic to go deep into the tournament. Julia Zhang, just a junior at the University of British Columbia, has been a defensive force this season for Traffic. She’s a young gun with Team Canada experience, including a World Junior Ultimate Championships Gold Medal last season defeating Jacelyn Verzuh from Seattle Riot and the rest of the USA team. Zhang is hard-working, technical, and incredibly athletic. She’s known to make big flick hucks and massive skies. She’s jumpy on the mark, pressuring them to throw turnovers, from which she strikes deep immediately for the score, like teammate and 2017 TC World Games player Terri Whitehead. Zhang has great defensive footwork in the breakdown zone when cutters are changing directions, making it easy for her to keep up with them. She has great closing speed so she capitalizes on moments when throwers think her check is slightly open. Her work ethic is also undeniable, as exemplified by her ability to run hard throughout long marathon points. She’s grown up a lot this year on Traffic, becoming more confident in her throws and offensive efficiency. Look for her to have a breakout tournament at Nationals, and next spring at UBC, with Traffic teammates Naomi Morcilla, Ellen Au-Yeung, and Serena Tam. I can’t honestly say that I've ever heard of her before I started watching Ozone footage recently. Turns out I should be more aware, she is wildly entertaining to watch. An absolute fireball cutter with incredible foot speed. Often starting out on defense and creating offense through blisteringly quick cuts on a turn. She’s on the shorter side, but that doesn’t keep her from absolutely dominating the deep space. She's often causing turns in the backfield with her lock down dump defense, and immediately flashing long on fast breaks. Her defense is menacing, for someone with a smaller frame you don’t often see such effectiveness on this side, but for Carver she uses it to her advantage. Using her quick turnover and footwork she can completely engulf opposing handlers, and create turns. When matched up on cutters, she easily shadows them and sneaks through tight gaps to get hand blocks. She's truly a pest to any offense being able to create havoc anywhere on the field. Consistent and poised on offense, Carver seldom takes risky shots. It’s almost unnecessary for her as the amount of yards she chews up often leads to short offensive possessions. Carver has been grinding on Ozone for the last four years, but this woman will certainly be dominating the club field at Nationals this year. She is up and coming talent in the women’s division, and bent on getting to the top as her talent grows. Anraya Palmer, is one of the quintessential glue girls around the country. Any team would gain a significant boost in efficiency with her on their roster. She is steady under pressure and rock solid. She makes hard throws break side without a second thought, opening up the field for her strong Ozone cutters. Watching her handle is a real lesson on staying aggressive, constantly striking, and making throws to spaces to lead her team to success. Her stat lines are generally modest, but they don't reflect her value as she holds the lines that she plays on together. An easy reset, and a great target in the end zone, she keeps handler defenders guessing on whether she’d rather score the goal or throw it. On film it appears she makes this choice for them, as she gets it done both ways with relative ease. On top of being exciting, efficient, and technically sound, her steadiness can’t be undervalued. As passes go to her you know that the right decisions are being made. Seldom does Palmer turn the disc, even when she challenges defenses directly and throws shots that other handlers are jealous of. She’s undeniably smooth, and fun to watch. She's a handler that certainly doesn’t see the level of praise she deserves for the amount of concrete support she provides to her team. Samantha Rodenberg is in her second year with Portland Schwa, a current Oregon State Ultimate player and quickly becoming a menace in the Northwest division. She’s gangly and wicked fast, but her stamina is what truly sets her apart though. She’s constantly and viciously taking her defenders on tours of the whole field, multiple times per point. This woman does not stop running. Quoted by her teammates as, “One of, if not, the most athletic player on the team.” And it shows. She consistently plays up against taller opponents, and her quickness and length frustrates her smaller peers. She seems at a glance like a plus defender just based on her athletic ability alone. She suffocates her opposition and runs them raw on the turn in utterly demoralizing fashion. She just cannot be caught. In the bits I’ve watched of her over the last two years, her game which used to lack polish is quickly cleaning up as her throws and decisions become more elite. Believe it, this woman will be at the forefront of Schwa’s attack for the foreseeable future, and there aren’t many out there with the combination of quicks and speed to match her. This woman is drastically underrated nationally. Popp slots in as primary handler for Schwa, but shifts seamlessly downfield whenever needed. An absolute stalwart with the disc, routinely commands the backfield creating opportunities for her teammates to succeed through reliable gainers and well placed crafty IO backhand breaks. Schwa's system allows handlers and cutters rotate between roles to create athletic mismatches. Eva flourishes in this regard, as she slots downfield a ruthless power cutter, fast and strong. It’s obvious from watching Popp that she’s played with some of the strongest cutters in Club during her time with Heist (2015), her cutting style shows flashes of Liza Minor, and Robyn Wiseman. At a glance she does appear more comfortable in the backfield, but her frame and speed make her brilliantly versatile. Fortunately for schwa Popp is the prototype for their system. Creating a team of homogeneously skilled and capable cutter handler hybrids. Beyond offense, Popp is an A+ defender, generally pushed into guarding handlers, or the middle middle in zones. Using agility and size to push discs out wide and into strong wing poaches from teammates. Certainly no slouch in the air, running down or boxing out on hucks. In the backfield bullying smaller handlers and stopping quick resets. Popp is a Jane of all trades, and seldom receives the praise for her impact. However, I’m fairly certain renown is the farthest thing from Popp’s thoughts as she quietly focuses on dismantling opposing D-lines. Very few players have the ability to step onto an elite women’s team in their rookie-year and make such a strong and immediate impact. French-Canadian phenome, Anouchka Beaudry, is only 19-years-old and has already established herself as one of the most dominant offensive handlers in the country. In the 2017 Canadian Ultimate Championship finals, Beaudry tallied 8 assists and 2 goals, earning herself the tournament MVP title. Her strong arsenal of throws open up the 6ixers’ offense and allows them to test teams with their deep game. She keeps the disc alive with ease, making difficult resets look effortless. Beaudry's height and long limbs make her a nightmare for handler marks, giving her an advantage on her around break throws. She is deadly with the disc on the endzone line. Despite her young age, Beaudry has had her fair share of high-level experience. In 2016, she captained the U19 Canadian Women’s Team, leading them to their gold-medal finish in Poland. Since then, she has competed on the Quebec club team, Iris, as well as the Canadian Women’s team at WCBU Championships in Royan. Her exposure to elite-level ultimate is obvious in her game and the way she attacks the disc and exploits the mistakes of her opponents on defence. She will be a pivotal part of the 6ixers offensive success this weekend and has proved this season that she is ready for the challenge. With that being said – Beaudry is only one of the many Toronto youth stars taking the field in Sarasota. Expect Laura Kinoshita, Cindy Truong, and Miriam Tingle to add pace and athleticism to the 6ixers’ game on both offense and defense. While the 6ixers definitely have their fair share of young and fresh talent, they also carry over a fair number of Capitals players that bolster their team with depth and experience. One deserving recognition is Sarah Bobak. The Capitals have a history of qualifying and performing at USAU Club Nationals and the 6ixers will look to re-establish themselves as a strong Canadian threat from the east. Players who have been the Nationals before will be important for the 6ixers as they enter a difficult Pool A in Sarasota. Bobak is tall, fast, and consistent. Her athletic plays dominate the downfield, making her a favourable target for the 6ixers. Bobak has been with the 6ixers from the beginning and is a crucial facet of their offense. She brings confidence and poise to a young and fiery squad and her emotional investment in the sport inspires her teammates and make her a leader on team on and off the field. In the Canadian final against Vancouver Traffic, Bobak was responsible for more than one impressive deep grab early in the game, ramping up the energy and shifting the momentum in the 6ixers’ favour. With the same athleticism that makes her a dangerous deep threat, she is also known for her run-through defensive plays. Her experience competing for Team Canada at the WUGC in London and WCBU in Royan will equip her to handle the pressures of the Club Nationals stage. Veteran players such as Meron and Tucker will join Bobak on the offense, both confident with the disc and capable of making big plays. The team has shown throughout the season that they are capable of top-tier performances, and strong performances from players like Bobak will be necessary to push the 6ixers to the next level. Jackelyne “Kobe” Nguyen is an absolute dynamo. She careens around the field with explosive intent. Looking for any spot to make her mark she can explode for a D, or leave her defender breathless as she strikes deep, again and again. Another tireless cutter with exceptional playmaking ability. Watching Kobe is almost always done with baited breath as you wait for her next play. Nguyen has a nose for the endzone as a steaking deep cutter, or ISOed in short endzone sets. She has the straight line speed and the quicks to tear through defenders in tight spaces. She appears fearless to whomever she’s thrown at on defense, and indifferent to those who mark her. In her second year on Nightlock she has made her mark, with tons of potential to expand her role to become more dynamic. Kobe’s role within Nightlock seems rather exploratory as she plays both sides of the disc in somewhat equal amounts. Her cutting and defense are roughly on par with each other making quite versatile between points. This makes game planning for her and Nightlock a chore. They never know where she’s going to hurt them, scoring goals, or preventing them. Emmy Kolanz is probably one of the most unheralded players in terms of usage and efficiency in the women’s game. A primary cutter for Nightlock’s O-line, she is unfairly shadowed by the big names of the West Coast when you look at her effectiveness. A tireless cutter, and sharpshooter she does a majority of the heavy lifting for Nightlock’s offense, and boasting very few turnovers she’s an ideal cutter, with throws to open up the field for her teammates. To put into perspective the overall effect Kolanz has for Nightlock: Kolanz had 11 touches, and 5 assists in their game to go at Southwest Regionals. These aren’t just little dinks for scores either, these are first or second cut catches then bombs to streaking deep cutters in stride. Her play style is reminiscent of Fey’s. Kolanz’s cutters immediately head for the house when they see the disc in her hands, and she fearlessly throws them open without a second thought. Even as such an aggressive thrower her turns are staggeringly low making her incredibly efficient. Her shot selection also has the benefit of ending offensive points at her discretion, allowing her to control the pace of the field while simultaneously saving her teammates legs. How Kolanz notoriety in club remains relatively small is baffling, luckily her game is one that will age well. Relying almost exclusively on technical skill, she will only become more dominant in the years to come.